Rich, strong, gleaming hair requires proper hair care -- washing and cutting on a regular basis -- as well as a healthy diet. While hair loss and duller-looking hair that becomes thin and breaks easily can be the result of many factors, a diet low in protein, such as during a crash diet, can lead to poor hair health. All forms of protein, whether animal or vegetable sourced, can help you have a healthy, balanced diet that will encourage healthy hair development. According to the American Academy of Dermatology, if you do not get enough protein in your diet, your body will begin rationing the protein it does have available, potentially reducing hair growth. That means hair will become older and more tired and brittle over time. If you have continued low-protein intake, for upward of two to three months, you will start seeing signs of hair loss. The U.S. Department of Agriculture recommends that you eat between 5 and 6 1/2 ounce equivalents of protein foods each day, averaging between 46 and 56 grams of protein. Ounce equivalents are serving sizes for different protein foods. For example, 1 ounce of meat, 1/4 cup of cooked beans and 1/2 ounce of nuts are all considered a single serving of protein food. The USDA recommends you eat at least 8 ounces of seafood each week as part of your protein consumption. Seafoods, namely fatty ones such as shrimp, salmon and tuna, are rich in omega-3 fatty acids, essential acids your body cannot produce. In addition to hydrating hair and helping keep it strong, they can help with relieving depression and mood swings, as well as reduce your risk of heart disease and arthritis. 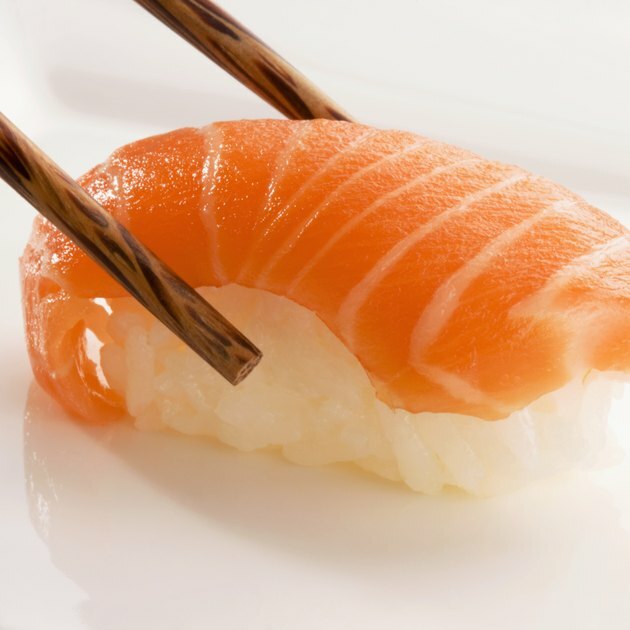 A 3-ounce serving of salmon has 5.4 grams of fat, 2.2 grams of which are omega-3 polyunsaturated fats. Many protein foods, animal and plant based, are rich sources of iron. Iron is essential for hair growth, and not having enough iron in your system can lead to hair loss over the long term. It also helps your body make red blood cells and is responsible for producing hemoglobin and myoglobin. Iron-rich foods include legumes, red meat -- especially beef -- but also dark meat poultry and some seafoods. A 3-ounce serving of lean steak has 1.56 milligrams of iron, while a 3-ounce serving of salmon has 0.68 milligram. This serving of beef provides 8.6 percent to 19.5 percent of the recommended intake of iron, while salmon has 3.8 percent to 8.5 percent of the recommended intake. Unlike with the other nutrients, too much vitamin A can also cause poor hair health. When your body has too much vitamin A, your hair stops growing. As a fat-soluble vitamin, excess vitamin A is stored inside your body. The recommended dietary allowance of vitamin A is 700 to 1,300 micrograms per day, and it is found in highest concentrations in liver and fish oils, including whole fish, such as salmon. A 3-ounce serving of beef liver has over 400 percent of the daily value, while salmon has only 4 percent of the daily value, both based on a 2,000-calorie-per-day diet. If you regularly eat beef liver or take supplements that contain vitamin A, watch your vitamin A intake to ensure you are not getting too much and stalling your hair growth. ChooseMyPlate.gov: What Foods Are in the Protein Foods Group? Can Eating Certain Foods Stop Hair From Falling Out? Can Food Make Hair Thicker?